I’ll cut right to it. The Trump administration just authorized oil companies to unleash an unconscionable assault on Florida’s marine life including dolphins, sea turtles, fisheries and whales. Presenting an early Christmas gift to Big Oil, Trump Administration officials are moving forward with opening our Atlantic Coast to dangerous seismic airgun blasting, the precursor to offshore oil drilling. We need your help to stop it. Offshore seismic tests shoot compressed air blasts at the ocean floor, revealing what lies beneath the surface. The blasts, emitted every 10 seconds for several months at volumes rivaling jet engines, injure and kill sea life, in particular marine mammals and fish species that rely on sound for navigation, mating and feeding. 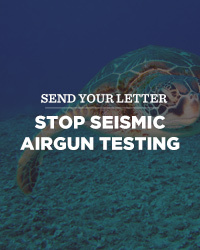 Click here to email Sen. Marco Rubio and urge him to join other Atlantic coast senators and oppose seismic airgun blasting, as well as any proposal that would provide giveaways to Big Oil at the expense of our coastal communities and marine life. Trump’s latest gift to the fossil fuel industry flies in the face of massive opposition along the East Coast, and particularly Florida, to offshore drilling and seismic airgun blasting. More than 220 local municipalities have passed formal resolutions opposing oil and gas exploration and drilling on the Atlantic coast or Eastern Gulf of Mexico, including more than 70 in Florida alone. In addition, nearly 2,000 local, state and federal officials have expressed concern or outright opposition to expanding oil and gas development. We’ve been fighting efforts to open Florida’s world-famous coast to offshore oil and gas drilling since our inception more than a decade ago, and we’re not backing down now. Urge Sen. Rubio to fight Trump’s latest scheme to open Florida’s world-famous coastline to offshore drilling by opposing seismic airgun blasting in the Atlantic. Opening the Atlantic to seismic testing and drilling would harm marine life, jeopardize our coastal businesses, tourism, and our national security. Worse yet, it would open the door to even greater risks from offshore oil and gas drilling down the road. Another disaster like the 2010 Gulf oil spill would devastate Florida’s marine life and ruin an economy that’s inextricably linked to health of our coastal waters. Thanks for urging Sen. Rubio to oppose seismic airgun blasting and the harm it would cause to marine life and ocean health, and the threat it poses to Florida’s coastline and economy.